Rattray Road | Eltham District Historical Society Inc.
Photo: The train to Montmorency crossing the Sherbourne Road overpass, c.1970 – courtesy of Russell Yeoman. When the railway came to Eltham in 1902 it traversed an extensive farm and bushland area between Greensborough and Eltham, known as the Montmorency Estate. This 925 acre property, Crown Portion 3, Parish of Nillumbik, was purchased from the Crown in 1840 by Stuart Alexander Donaldson. He soon sold the land but then it remained in the ownership of the Donnithorne family for very many years. 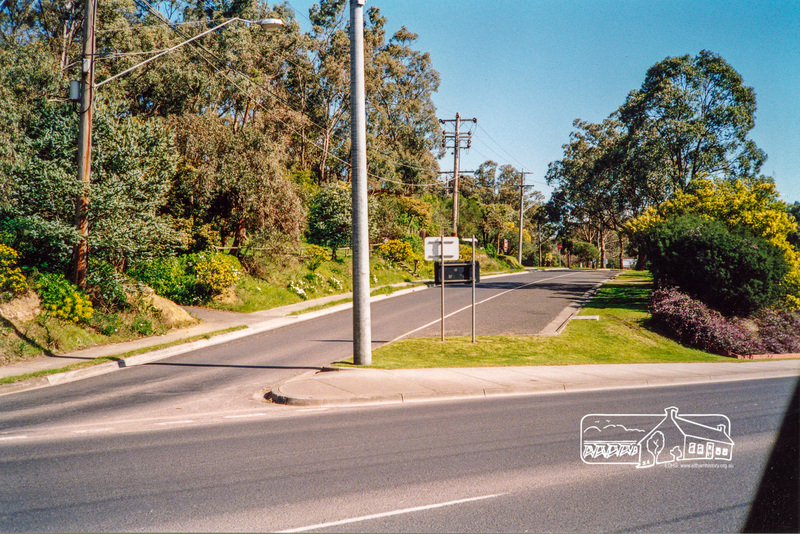 A public road from Eltham to Greensborough was constructed through the land, (part of today’s Sherbourne Road and Karingal Drive). Apart from that the land remained intact until acquisition of land for the railway which ran through the middle of the estate. of about 10 acres each. New roads were created through the land including Sherbourne, Rattray and Mountain View Roads. The development was promoted as having access to the railway at Greensborough station but there was no station within this estate. By 1923 a community had developed within the Montmorency Estate. It included a school and St Faiths Anglican Church. Local residents and the Eltham Shire Council became involved in moves to have a railway station opened at Montmorency. Many years later Shire Secretary Max Watson assembled a file of correspondence and newsletter articles on the station and this file forms part of our Society records. The proposed station site had no road access and the Railways Department required that access be provided before it would open a station. The streets opened for this purpose are Mayona Road, Were Street and Binns Street. The file indicates that there was widespread community agreement to the project which included provision of roads through private property and payment of construction costs by residents. This enabled the Council to provide a guarantee to the Railways Department to enable construction of the station to commence. It was noted that 40 people had agreed to buy train tickets. As the project proceeded a level of disagreement between neighbours became apparent. Some were donating land for roads but others required payment. Those donating land did not think that they should be paying any costs. Some thought that the roads should only be available for use by those involved in the scheme. Dr. G Nicholson was only prepared to donate his land if the roads were available for public access. The station opened on 5th September 1923. Children and the School Committee were granted a joy ride to Eltham and back. It seems that the disagreements in the community were resolved and the Council constructed the access roads soon after the station opened. The establishment of the station at Montmorency led to development of the area for residential purposes. By the end of the 1920s many of the large blocks of the Montmorency Estate had been subdivided into conventional suburban building blocks and soon the fledgling Montmorency shopping centre appeared in Were Street.